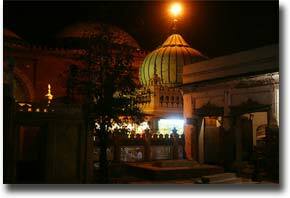 Hazrat Nizamuddin Auliyaa Dargah is situated in New Delhi which is across the road from Humayun's tomb. The 'dargah' of revered Sufi saint Hazrat Nizamuddin Auliyaa has its devotees all over the Islamic world. A settlement has sprung up here during those times known as 'Nizamuddin' for short. This holy shrine also houses the tomb of Amir Khusrau, a famous poet and the saint who was the beloved disciple. Encroachments plaque the shrine and the area itself seem to belong to another century. The shrine was built by Muhammad Tughluq and is one of the sacred places of pilgrimage in India. Other tombs situated inside the complex of Hazrat Nizamuddin Auliyaa Dargah belong to Begum Jahan Ara, Shah Jahan's favorite daughter, and Mirza Ghalib. Every Thursday, one can hear qawwalis here around sunset. 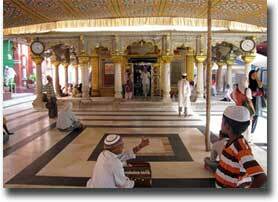 According to the legend of Nizamuddin, Shaikh Nizamuddin was born at Budaun in 1236. He came to Delhi with his mother and became the disciple of the famous saint Shaikh Farid Shakarganj. The rulers such as Ala-ud-Din Khilji and Muhammad Tughluq were devoted to him. It is said that he had already prophesized beforehand that city of Tughlaqabad could never prosper and that Ghiyath-ud-Din Tughluq, who was then in Bengal, would never see Delhi again. The prophecy came true and he died in 1325. The original tomb has been renovated many times and the present tomb was built in 1562. The area around the tomb is regarded as sacred. Twice every year, the festival of 'Urs' is celebrated here to commemorate the death anniversaries of Hazrat Nizamu'd-Din Auliya and Amir Khusrau. This locality of the dargah, known as the Nizamuddin 'Basti', is dotted with several monuments, most of which have been encroached upon. The area however, remains a fascinating place to explore, as it seems to belong to another century altogether. Muhammad Tughluq built this tomb and to this day, the place is one of the sacred places of pilgrimage. The complex of the shrine also contains several tombs including the tomb of Shah Jahan's beautiful daughter, Jahan Ara Begum and of noted poet Mirza Ghalib. Built on the way from Humayun's tomb, the premise of the shrine is a tank, which is surrounded by many other tombs. It is said that there was an argument between the rulers of Tughluqabad and the saint over building this tank. Shaikh Nizamu'd-Din was born at Budaun in 1236. He lost his father at the age of five and came to Delhi with his mother. Later he became the disciple of the famous saint Shaikh Farid Shakarganj, who appointed him as his successor. Both Ala-ud-Din Khalji and Muhammad Tughluq were devoted to him. He prophesied that Ghiyath-ud-Din Tughluq, who was then in Bengal, would never see Delhi again and his prophecy came true, as the Sultan died in a temporary structure some 6-km south of Delhi. Hazrat Nizamu'd-Din expired in 1325. His original tomb does not exist any longer. It was repaired and decorated by Feroze Shah Tughluq, but even the repaired building has disappeared. The present structure was built between 1562-63 by Faridu'n Khan, a nobleman with a high rank, and has been added to or repaired later by several persons. It consists of a square chamber surrounded by verandahs, which are pierced by arched openings, while its roof is surmounted by a dome pringing from an octagonal drum. 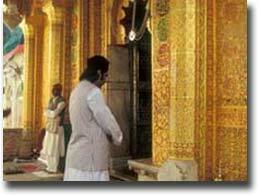 Ajmer Sharif is a city that is situated in the middle of the Indian state of Rajasthan. To reach Ajmer you can come by Rail, Road or by Air. Here are the details of how to reach Ajmer. Through Airways -Through Airways the nearest International Airport is the Indira Gandhi Airport in New Delhi. Ajmer is only 350 kilometers from here. The nearest domestic Airport to Ajmer is Jaipur that is only 135 Kilometers from Ajmer. Through Railways - Through Railways, many trains from different states of India halt at Ajmer Junction. Through Roadways - Throuh Roadways to reach the place, there are government and private bus services operating from Delhi, Ahmedabad and other major cities of India. Private cars are also available on hire.